Cairo to California includes stories of the important personages and periods of bellydance evolution from its birthplace in North Africa to its innovations in North America. It is comprehensive but concise, written in an easily accessible language, and thoroughly researched by a cultural anthropologist. It includes a bibliography and glossary of terms. If you are a student of anthropology, dance, women’s history, or world culture studies you will find it a valuable resource for your personal or classroom use. This past weekend (October 5-6, 2013), Linda Holiday Sensei, chief instructor of Aikido of Santa Cruz celebrated the release of her book, Journey to the Heart of Aikido: The Teachings of Motomichi Anno Sensei. It chronicles her spiritual journey with Anno Sensei, eight-dan and master instructor of aikido. In honor of the launch of the book, many featured characters in her personal history—including Anno Sensei, and Senseis Mary Heiny, Robert Frager, Jack Wada—attended and spoke at a public reading and conducted special master classes. Let me step back for a moment to explain how all these relationships began and why they are significant in the publication of this book. It begins in 1969 when Robert Frager began teaching aikido at the Mission Hill High School in Santa Cruz. Both Jack Wada and Glen Kimoto began their training there. In 1970, Frager began teaching aikido at UCSC and invited Frank Doran to join him. Linda began her practice while a student at UCSC in 1971 and by 1973 had moved to Japan with classmate Jack Revoir to deepen their understanding of the art. While in Japan she met Mary Heiny who introduced her to O-Sensei’s student, Michio Hikitsuchi Sensei. Heiny Sensei took over instruction at UCSC in 1974, passed the position on to Jack Wada who tricked Linda Holiday into taking over the class by saying he was taking a short leave of absence. 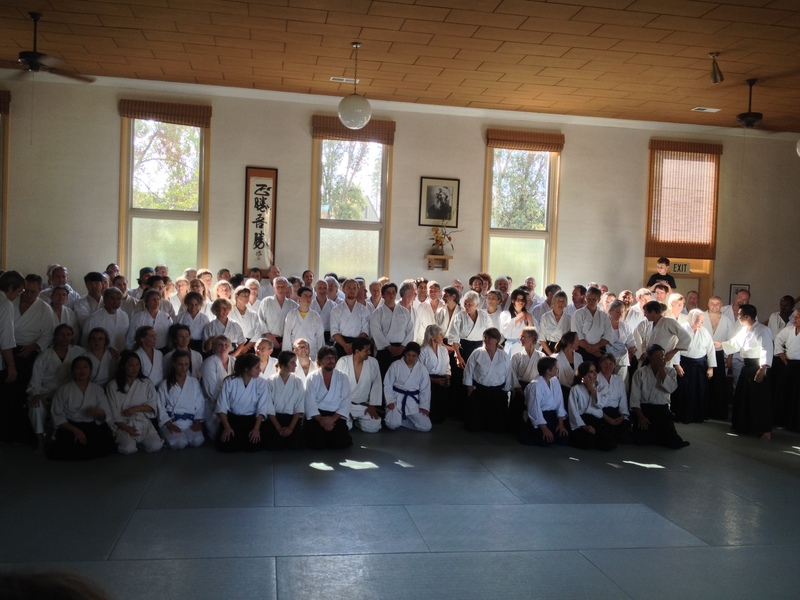 In 1982, Linda and others moved off campus to open an independent dojo, North Bay Aikido. As many of you know, I conducted my doctoral fieldwork at what was then called North Bay Aikido. During the first year of my training at North Bay, the dojo moved from its charming but too-small space on Washington Street (now Kali Ray yoga) into its permanent 5,000-square-foot location on the corner of Chestnut and Mission. The move marked the end of an era in the history of aikido in Santa Cruz, the period of its early development (1969-1996) and the beginning of a new period of spiritual growth. In 1999, the year I concluded my research, Linda Sensei invited her mentor, Anno Sensei, to visit the dojo. Anno Sensei, in fact, has visited Santa Cruz nearly every year since that inaugural event. Linda and other dojo members frequently visit Anno Sensei at his dojo in Shingu, Japan. They just couldn’t let go, and have instead created a unique and profound bond between these far-distant dojos. In the years since 1999, Linda Holiday began recording her conversations with Anno Sensei about the heart of aikido and translating them into English. The result is a record of Linda’s path into aikido, both historically and spiritually, and—perhaps more importantly—the life history and spiritual teachings of one of aikido’s most precious resources, Motomichi Anno Sensei. And so, after an evening of selected readings from the book, comments and stories about training in aikido in those early years, and demonstrations by children, young adults, and senior practitioners, the celebrants returned to the mat on Sunday morning for a long day of training. I stopped by to watch for a while. Many of the same people who I was training with back in 1999 are still out there (though, they are grayer, balder, and have a harder time getting up from seiza). But the spirit moved everyone and carried on even into Tuesday nights regular evening class taught this time by Anno Sensei. From what I am told, the closing circle was quite emotional and prolonged…because no one was ready to let go again. That ineffable event that Linda predicted in 1999 has evolved into a bond so strong that hearts have been forever changed.